Your flooring choice will have a big impact on the look of your home, how easy it is to maintain, and its long-term value. The right floors will help you create a beautiful space effortlessly. The right floors will also stand up to the foot traffic in your home and meet the needs of your lifestyle, such as providing durability for kids or pets. And, of course, the right floors will improve the value of your home. Wood flooring can provide a traditional or a modern look, depending on the type you choose and how you pair the flooring with the décor. Many people prefer hardwood flooring because it not only looks beautiful, but it is also relatively easy to clean. You just need to keep it swept and occasionally mop it (using a cleaner designed for hardwood floors). The drawback to hardwood flooring is that it is easily damaged. It can be scratched, scuffed, dinged or stained through everyday wear and tear. Arizona is a sandy place, and just tracking the sand in on your shoes can scuff up your hardwood floor. You’ll have to think carefully about whether you’re willing to put preventive measures in place, such as regularly sealing the floor or taking off your shoes inside. Laminate floor can have the look of hardwood without the price. You can get laminate floors like the old-school vinyl rolls, or you can get laminate floors that are manufactured wood with a laminate veneer. Either way, they will be easily to clean with a simple sweep and a damp wipe. Laminate can damage easily. If you get it too wet, it can chip and peel. It can scratch and stain easily, as well. Cork is growing in popularity as a flooring choice thanks to its environmentally friendly properties. Hardwood is taken from trees that have to be grown for decades, so it is not an easily renewable resource. Cork, however, is taken from the bark of a tree, and it can be replaced quickly. Cork is also a good choice for flooring because it is soft on the feet, naturally warm, and absorbs sounds, making your environment seem more inviting. It provides great insulation, which can reduce the energy costs in your home. Cork may be absorbent, but it is also antimicrobial, so you don’t have to worry about spills causing bacteria or mold to spread. You do have to worry about cork floors fading since the material is susceptible to bleaching in the sun. Cork can also swell with exposure to moisture, and it can be damaged under heavy objects, such as furniture. It is a better choice for flooring in areas like hallways or entryways where there are not large pieces of furniture like a couch or bed. Carpet is the classic flooring choice, and many people like the feel of the soft fibers under their feet. Carpet has come a long way, and it is now available in a wide variety of fiber types and designs, allowing you to get just about any look and feel you want. Carpet is also relatively inexpensive, though the final costs depend on the design options you choose. The major downside to carpet is that it is hard to keep clean. Sure, you just vacuum it and things might look ok. But vacuuming never really gets out all the dirt and dust that gets trapped in the fibers. Over time, your carpet will smell and it will look dingy. If you have allergies, carpet will aggravate them over time. Carpet is also highly susceptible to staining. One spilled drink or pet accident can cause a permanent stain, even if you are fast and diligent about removing the mess. Tile is a great all-around flooring choice for Arizona homes. Tile is available in a variety of materials, sizes, shapes and colors, helping you get whatever look you want for inside or outside your home. You can even get tile planks that emulate the look of hardwood. Tile is easy to clean, as well, needing only a regular sweep and mop. It can become stained if you do not clean up spills immediately. Sealing the tile will help guard against staining and make it easier to clean the floors. Make sure you choose a durable material that is not as prone to scratching. Many people overlook the importance of flooring as just a personal preference, but it can affect so much more. Make sure you consider the durability of the material, the ease of cleaning, and more when you choose the flooring for your Arizona home. 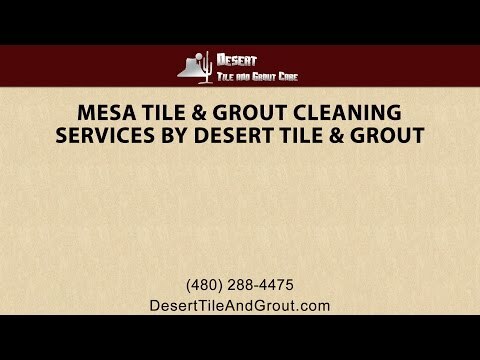 If you have tile, call Desert Tile and Grout Care when you need professional tile and grout cleaning in Arizona. We are a top-rated tile floor cleaning company in Mesa thanks to our superior service and our exceptional results. After our tile and grout cleaning in Mesa, your floors will look like new. You’ll save yourself a lot of money on repairs or replacement just by getting our intensive cleaning services. Call us today in Arizona to learn more about our services, or look at our online reviews to see why are considered a top tile floor cleaning company in the state.